Made in house so they fit standard and non standard sizes such as Small Double Beds. Cut and made in high 200, 400 and 1000 Thread Count fabrics. If you cant find your size or are looking for something in particular please call 01706 220020 or email us, we'll be happy to help. Our luxury bedding sets can elevate your bedroom, creating a decadent hideaway. We create unique bed sets with beautifully soft sheets and covers coupled with cushions, luxury bedspreads and other accessories. Transforming your bedroom into the most luxurious room in your home. View our range of products in our online store and shop at your convenience. If you can not find what you are looking for use our search feature or contact one of our friendly team using the live chat feature or by calling 01706 220020. We have colours to match any style and a range of sizes from small double bedding to Emperor Bedding. Ava Boudoir CushionBright cushion with florals and butterfliesSize: 43 x 43cmPart of the Oasis Ava b.. 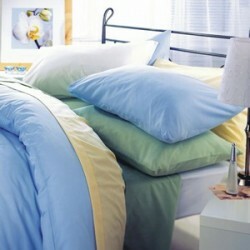 Designer Bedding Set - Oasis - AvaLuxury 100% Cotton Bedding SetIncludes:1 x Ava Duvet Cover4 x Ava ..